Indian Air Force Eligibility Criteria 2019:- Check Indian Air Force Height and Weight Chart For Males and get IAF Age Limit, Physical Standards, Educational Qualification, Running Time and Medical Test related all details. Indian Military exist for the sole purpose of defending the country from various threats that may harm the nation and disrupt the peace that prevails across the country. The Indian Military is composed of three major component such as the Indian Army,Indian Navy and the Indian Air Force and are entrusted with the responsibility over their filed of expertise to maintain safety and security by defeating any sort of threats that arise. Among these military component the Indian Air Force is a major armed force unit which is responsible for the security of the Indian airspace and are the aviation unit of the Indian Military. Since in the modern era the threats from the aerial territory are damaging and the airspace is one of the vulnerable portion of any nation which is to be checked and the security is to be maintained. Indian Air Force is considered to be among the best of the air forces unit in the world and has been regarded to be the 5th largest armed force in terms of aerial strength. The service men of the armed force of the air force are highly trained who are to undergo vigorous training and are transformed into personnel who are the experts in their line of duty or their field. The strength of the Indian Air Force has been displayed in various conflicts involving the Indian Democracy where the armed force has provided exceptional service and support to the Indian Military troops through aerial path an has made vital contribution in some of the glorious victories achieved by the Indian Military in the past. The Indian Air Force is comprised of the three major categories divided according to the various section responsible for the complete functioning of the air force as one single unit. In this article we will discuss the various eligibility that are required by the individuals if they desire to enroll themselves for the Indian Air Force, under the above mentioned branches. Since each of these unit are different depending upon their daily routine and general duty they are entrusted with,thus the eligibility that have been set will vary based on the unit of the Indian Air Force. Further on let us focus upon the Indian Air Force eligibility that are prescribed or set for every cadets who desire to apply for each of the branches. Every year huge number of cadets apply for their selection into the IAF through the various entry level but most cadets fail to qualify under the eligibility criteria that are required. Check here Eligibility For Air Force After Graduation and Eligibility For Indian Air Force after 12th class education. So in order to provide the cadets with the information that is necessary for the individuals to acquire before they apply for the particular branch of the Indian Air Force here we have mentioned the entire details for each of the branch in terms of eligibility so that the cadets apply for the branch for which they are eligible based on the different eligibility criteria that have been set. Candidates applying for all branches through the NDA entry should be between the age of 16 years 6 months to 19 years. After the age limit the next eligibility criteria is the educational qualification that is set particular for each of the IAF branches which the cadets must possess in order to be eligible under the educational criteria as required. Moving on we will be providing the entire and overall information regarding the educational requirement for each branch n a specific manner so that the individuals will acquire the clear idea regarding the educational eligibility. Further on we will be listing the entire details regarding the educational qualification that is required for each of the unit of the IAF which is absolute for the candidates. Since the air force is composed of various units the educational requirements are set according to the unit the individuals desire to apply for their recruitment. Below we have mentioned the overall requirements in terms of the educational eligibility for each of the unit. 1. Flying Branch:- This particular branch of the IAF is the aerial operational branch which offers the post of pilots such as for the Fighter jets pilots,Helicopter pilots,Cargo pilots,which are the essential functioning unit of the armed force that remains equally active during every operational mission and daily routines carried on by the IAF. NDA Entry:- Candidates who will be applying through the NDA entry require to have passed their respective 10th standard or equivalent exam(12th passed) 60% form science background with Maths and Physics being the compulsory subjects. CDSE (Graduate candidates):- Graduate individuals who have passed form any recognized university with Physics,Maths & Chemistry during 10+2 with 60% are eligible to apply for this branch. Candidates with a BE/B Tech(For Year Course) degree are also eligible. Note:- There is no percentage bar for the candidates who are gradudates. 2. Technical Branch:- The technical branch of the IAF is the unit that is responsible for the entire technical section that involve the mechanical,electronics equipment that are the integral parts of some of the most sophisticated machinery that have been provided to the IAF. Therefore the individuals will require to have proper knowledge in the field of mechanics and electronics and other essential machines. The branch offers various section or department under the ACE or Aeronautical Engineering Course for the candidates who are eligible according to the requirements for each of the department as prescribed. The candidates will need to qualify under the qualification that has been set mentioned as follows. This is the Indian Air Force Technical Branch Qualification criteria. NDA Entry:- Aspirants applying through the NDA entry require to have passed their respective 10th standard or with 10+2 educational qualification(12th passed) 60% form science background with Maths and Physics being the compulsory subjects from any recognized educational board. UES University Entry Scheme(Graduate Individuals):- The candidates must be presently studying in the final year/semester of BE/B.Tech Degree with the the minimum of 60% in overall category. Aeronautical Engineering Course(Electronic):- Four year degree from a recognized university/Should possess the Graduate membership exam of the Institutes of Electronics & Telecommunication Engineers/Passed the examination(Section A & B) of Associate Membership of Institution of Engineering/Passed the exam of Aeronautical Society of India(Section A & B). The candidates must have studied at-least eight(8) subjects. Aeronautical Engineering Course(Mechanical):- Four year degree from any recognized University/Passed the examination(Section A & B) of Associate Membership of Institution of Engineering/Passed the exam of Aeronautical Society of India(Section A & B). The candidates must have studied 8 subjects which are the mandatory subjects during their educational period. 1).Administrative Section:- The administrative section involves the Air Traffic Control,Fighter Controller. The candidates should be a graduate in any discipline with 60% in aggregate terms. 50% marks in aggregate terms for Post Graduate candidates or with equivalent diploma in any discipline. 2).Accounts Section:- This section deals with the entire financial management of the entire air force unit. Graduate individuals:- The educational qualification should be Graduate Degree in Commerce (B.Com) with the minimum of 60% in aggregate terms in all paper. Post Graduate individuals:- The candidates will require to a Post Graduate in Commerce(M.Com) or CA or ICWA with the minimum requirement of 50% in aggregate terms in overall paper. 3).Logistic Branch:-This section is responsible for the management of the various materials and the resources that are required by the IAF,such as the supervision over inventories,different range of equipment. Graduate Candidates:- Should have attained graduation from any discipline with the 60% as the minimum marks required in overall papers and in aggregate. Post Graduate Candidates:- Should possess the post graduation degree in any discipline or equivalent degree with minimum of 50% in aggregate and in all the papers. 4).Educational Section:- This section of the ground branch is only offered to the candidates who are post graduates with the following requirements. Post Graduation Degree in any discipline with the minimum requirement of 50% in all the paper and in aggregate. 5).Meteorology section:- This section of the ground branch is entrusted with duties to operate the various equipment regarding the satellite imaginary and monitoring equipment an such. The candidates must be a post graduate individual with the degree in any Science Stream/Maths/Statistics/Geography/Computer Application/Environmental Science/Applied Physics/Oceanography/Agriculture Meteorology/Ecology & Environment/Geo-Physics/Environmental Biology with the minimum of 50% in aggregate an in all the papers and should have studied Maths and Physics during graduation and should have scored minimum of 55% in each of the subjects. The educational qualification that are required for each of the unit have been mentioned above according to the unit or the branch and the different and divers section under each of the branch of the IAF. Physical Criteria:- The physical standards of the candidates are must which are examined depending upon the physical requirements that have been set for the requirements as per the eligibility. The candidates must have the required physical criteria in terms of height ,weight and chest,however these criteria are set according to the age of the individuals. Check Indian Air Force Physical Test Requirements and get details of minimum height For air force male candidates. Therefore we have provided with the overall chart of the physical requirement and since there are some relaxation that have been offered to the candidates based on the region. 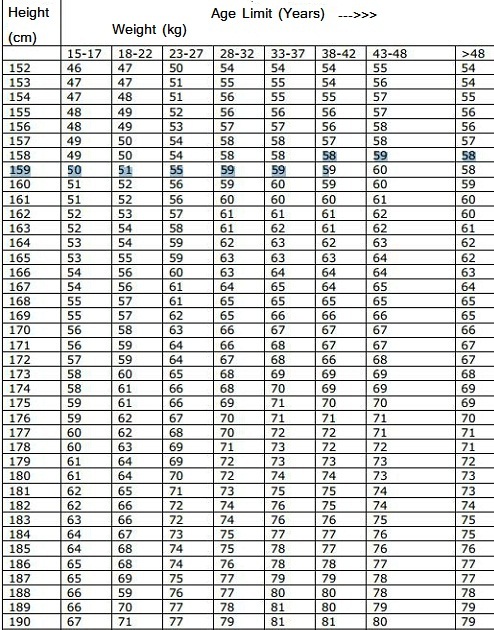 Check the air force height and weight chart for males and know about the eligibility. Medical Requirements:- The candidates must have a proper medical standards which si necessary for them to fulfill their routine and daily duty to maintain the smooth functioning of the armed force. The medical standards of the individuals are examined by the specialists of the Military Medical Corps under the various medical requirements such as medical health,Mental status,Eye sight,Hearing ability,Dental or Oral health,ENT. Any sort of medical setback such as bone deformity,long-term illness,presence of wax in ear will be responsible for the rejection of the individuals. So the age limit and the educational qualification varies among the branches that offers the individuals with the opportunity to be a part of the IAF but only if the cadets are not able to qualify under the various required eligibility that following after the age limit criteria such as the education ,physical ,medical criteria as mentioned above. And only those candidates who are declared as eligible under the entire required eligibility criteria will be allowed to undergo the selection process held for the recruitment of new batch of cadets. Aspirants with any sort of information requirement can comment below in order to acquire those requirement that will be provided. Best of luck, Jai Hind. How To Join Indian Air Force After 12th 2019:- Get details about Join Indian Air Force Pilot, Flying Officer Entry Type and Eligibility Criteria For Join Indian Air Force After Graduation and After 12th Commerce. The Indian Air Force came into existence on the 8th day of the month of October of the year 1932. This unit of the Indian Military was established for the safety of the aerial and the air space of the Indian Democracy. Since the establishment of this armed force the service that has been exhibited by the service men of the IAF has been of the distinct level and is a vital unit that has had a huge impact interms of national security. Altogether with a approximate number of about 140,139 active personnel and an estimated number of 1,720 plus aircraft the IAF has been entrusted with the safety of the national territory through the watch over the aerial or the air space of India.The Indian Air Force is also considered to be the fourth largest unit of active personnels among the other air forces of the world. Until the Indian democracy was declared as Republic nation the armed unit of air force was then known as the Indian Air Force(IAF) which during the per-Republic was known as the Royal Air Force serving under the Dominion of India. Even the unit of the air force of India was established in the pre-independence phase but the unit came to be known after the independence and became an Republic nation in the year of 1950,therefore the IAF officially came to existence in the respective year. The foremost priority of the IAF is to secure the airspace of the national territory in cases for national emergency and to secure the safety of the nation form the threats upon the nation through the air space. The IAF has made some of the major contribution to the nation of India throughout the some of the extreme phase of warfare and has honored the country with their distinct level of service making the nation proud and ensuring the safety of not only the nation but safety of the citizens. The Headquarters of Air Force is based in Delhi,the capital of India and the President of India is honored as the Supreme Commander of the IAF. CAS or Chief of Air Staff are the four star officers who are appointed as the Air Chief Marshal which is the higher rank of the Indian Air Force with the responsibility of the overall operational command of the unit. On the 26th day of January of the year 2002 the IAF was honored with its first ever Marshal of the Air Force who is the only five star officer of the unit and was conferred by the President of India to Mr. Arjan Singh,who is the only five star Marshal of the Aif Force in the history of the IAF till date. The IAF is considered as a absolute enforcement to the other units of the Indian Military such s to the Indian Army,Indian Navy during the periods of national protection and the events of warfare interms of Indian boundaries. Every year number of new cadets are selected for their service through different types of entry that offers great opportunities to those individuals who have the courage and the will to serve ones nations through the IAF. Since the service under the IAF is without any doubt among the most challenging and adventurous section of service among the other armed force services,where the individual must have a clear conscience of serving the nation without failing but giving all that can be offered for the sake of nation safety and the protection of the lives of the national population form any means of threat. Check:- How To Join Indian Army and Join Indian Navy After 12th. Hence due to the quality of service men required to serve the country under the wings of IAF is the most important factor that compels the recruitment of new cadets to be of the higher level with a tough competition among the cadets who have enrolled themselves for the recruitment held by the officials of the IAF. There are various level of entries that can be chosen by an individual to enroll for the recruitment of the IAF,one of them being through the NDA,but only the eligible and qualified cadets are allowed to enroll for the recruitment. So the cadets must possess the required eligibility criteria and the qualification such as educational level,age of the cadet,and some others are among the various requirements to apply for the selection. NDA is one of the important Defence Academy which in due course of time had produce number of service men for the IAF,for the new cadets to be selected for the NDA are shortlisted through the entrance exam conducted by the UPSC(Union Public Service Commission),this entrance exam is held twice a year. Join Indian Air Force After 12th Science and get details how to join Indian Air Force After 12th Commerce. Every year huge number of interested cadets apply for this exams for the NDA selection but only the best candidates are selected through this exams conducted by the UPSC. There are other Defence Academies which may been of a massive support for the recruitment of new and qualified cadets to serve under the IAF such as the IMA, AFA. The competition is always tough among the enrolled cadets during the selection which makes complete sense due to the requirement of the qualities to serve the nation under IAF which is one of the challenging and also a demanding field of service. Since the entry level for the cadets beings from 10th passed educational qualification with certain eligibility criteria which is similar to those cadets with higher educational level of 12th pass. Hence the entry level of 12th pass is the ultimate level of entry, a cadet can apply for the recruitment of IAF,due to age eligibility criteria which is a vital requirement. Therefore further on the details related to the recruitment for 12th passed cadets will be provided regarding the eligibility criteria,qualifications,age limits for the cadets interested to apply for the written exams and other phases of the recruitment of the IAF. NOTE:- Commerce students not eligible to Join Indian Air Force after 12th. Although there are various types of entries to apply for the recruitment of IAF for the cadets who have higher educational level of 12th pass,but there are criteria under which a candidates must qualify to be eligible to apply for the selection. Thus the eligibility criteria is the basic requirement for a cadet applying for the 12th level entry through any type of entry there is for the recruitment. However,the different types of entry are basically similar among each other,hence let us firstly focus upon the types of entry an individual can choose for the recruitment of the IAF service men with 12th pass educational level. The mentioned above are the types of entry for the cadets applying for the recruitment in the IAF. But there are eligibility criteria a cadet must qualify under to appear for the entrance exams conducted for the selection of cadets for the IAF service. Their are so many ways to Join Indian Air Force After Graduation. Generally the eligibility criteria for these type of entries are somewhat similar only being different in case of age limits,subject combinations,academic performance,etc. So the main priority of this article is to provide the necessary information regarding the different types of entry and their diverse eligibility criteria for a cadet to be eligible to apply for the selection exams for the service of IAF (Indian Air Force). The NDA or the National Defence Academy has been a intergal part of the Indian Military providing the armed units of the Indian Military i.e, Indian Army,Indian Navy and the Indian Air Force with numerous new cadets very year who graduate form this Defence Academy acquiring their initial or the basic academic training and such other training related to the field of service the cadet has been selected for. The NDA provides the cadets with the training for a certain period of 3 years or 4 years depending upon the entry level of cadets who are selected through the entrance exams conducted by the UPSC. The NDA conducts the entrance exam twice every year for the new recruits of different entry level,therefore even for the selection of cadets of 12th entry level this exams are held twice a year with the eligibility criteria and the required qualification of the cadets being the initial significance one must consider to apply for these exams. Educational Level:-12th Passed (Science Stream). Age Limit:- 19 Years & 6 Months. Only the candidates who had science as their stream during class 12th are eligible to apply for the recruitment of IAF service. The candidates must clear the entrance exams with at-least the minimum passing marks or with higher which is valuable for the cadet during the final selection. The CDSE or the Common Defence Service Exam is also conducted under the supervision of the UPSC,this type of entry is also among the other types of entry which is held twice every year. This entry type is one of the common type of entry that attracts huge number of candidates with 12th or higher educational level such as graduates. Educational Level: 12th(Science Stream) pass or Graduate with PCM Physics, Chemistry & Maths in 12th standard). The cadets qualifying under the mentioned above eligibility criteria are qualified to apply for the entrance exams conducted for the recruitment of new cadets into the Indian Air Force of the Indian Military for their service. The entry of the candidates through the AF-CAT entry type known as the Air Force Common Admission Test which is conducted under the supervision of the Air Force Headquarters. This type of entry is similar to the previous two of the entries where the cadets are required to appear the entrance test conducted by the IAF Headquarters,this examination is conducted twice every year for the recruitment of new cadets for the different branches of the IAF based on the vacancy only the required number of cadets are selected through this exams. Technical Branch: 12th Passed (Science)& Pre-Final Engineering cadets. Flying Branch: 12th Passed (Science)& Graduates (PCM In Class12th). Ground Branch: 12th Passed (Science)& Graduates (PCM In Class 12th). NOTE:- Pre-final engineering cadets are eligible to apply the AFCAT exams through the UES entry but the cadets are only eligible to apply for the Technical branch of the IAF. On the other hand the cadets if being a final final year students of engineering or other educational section with PCM as major subjects during their 12th are eligible to apply for all the mention above branches of the IAF but the other eligibility criteria will be consider however. Unlike the first two entry type the entry type through the FST or Fast Track Selection is also one of the important type of entry which is also conducted by the Air Force under the supervision of the IAF Headquarters. The FTS is conducted depending upon the number of vacancies that are available based upon which the FTS exams are conducted. Therefore there is no certain fixed time of the year when this selection of new cadets are selected. However this test or the selection is held whenever there are vacancies available for the new cadets in the different branches of the IAF. Thus to know about the schedule of the FTS which is to be held shall be informed or advertised to the concerned cadets through the websites and other means. Lastly the eligibility criteria shall differ according to the selection to be done for the respective branch of the IAF. Flying Branch: 12th Passed (Science)& Graduates (PCM In Class 12th). The above mentioned information are the different types of the entry that one can choose from according to their qualification and eligibility criteria. Cadets interested for enrolling for the recruitment of the IAF shall have a better and wide idea and the necessary before applying for the entrance exams that is conducted for the selection of the new cadets. As much as challenging the IAF service is considered is he information just enough to assume that without a sign of doubt the written exams that are conducted under the different types of entries shall be equivalent to the challenges and the toughness the service men of the IAF need to face during their duty. Therefore it is advised that the cadets preparing for the written exams should prepare well is one desires to clear the exams and then be included in the final selected cadets for the IAF. Mostly the written exams are conducted upon the selected subjects covering some of the major topics under the particular subjects.The syllabus mostly covers the syllabus of the 8th,9th,10th,11th,& 12th standard of the educational board of any board generally of the science section. Concerned individuals are welcome to Keck on this website time and again when in need of information regarding the IAF or the Indian Military unit as the information regarding the field of service shall be updated on a regular basis interms of recruitment dates and other related information. The information that has been provided maybe of some help and give the individuals a rough idea regarding the types of entries for the IAF recruitment. Thank you all and best of luck to all the candidate preparing for their respective exams. Indian Air Force Y Group Solved Question Paper PDF:- Download Air Force Y Group Previous Year Model Paper PDF File from here and official site. Get IAF Group Y Old Question Paper and Sample Paper In Hindi For Written Exam preparation. Indian Air Force is one of the vital armed force unit among the three major armed force of the Indian Military which was established by the East India Company in order to provide the aerial support to ensure safety of the British interest. Indian Air Force was founded on the 8th of October in the year of 1932 and was known as the Royal Indian Air Force and was active during the event of World War 2 representing the British Empire. However after the independence of India and the transition of the government to a Republic in 1950 the now known Indian Air Force was established and transferred under the Indian Military. Every year on the 8th day of October the entire military along with the nation enjoy the anniversary of the Indian Air Force which has been a firm support to the Indian Military during the engagements of the troops during major conflicts and operational tasks. The President of India is regarded as the Supreme Commander of the Indian Air Force,and the Chief Of Air Staffs are known to be the Air Chief Marshal which is the highest rank among the Air Force staffs who are entrusted with the duty over instructing the Air Force units to carry on various operational task and the mission under taken by the Indian Air Force. Download Indian Air Force Y Group Previous Year Question Paper PDF for written exam. The Indian Air Force is served by 140,139 active personnel and with a approximate number of 1,720+ aircraft that provides the service men with great assistance during operational task.The Indian Air Force is considered to be the fourth largest air arm among the other air forces in the world. The Indian Air Force is also known as the Bharatiya Vayu Sena is the armed force of the Indian Military which is the responsible to secure the Indian airspace which is the primary task and to engage during aerial warfare during major armed conflicts and to provide aerial support to the Indian troops during various operations. Indian Air Force has been actively engaged during major warfare armed conflicts that has involved the Indian nation and during these events the Air Force has made some of vital contribution that has led the Indian Military to achieve some of the glorious victories. The Indian Air Force being served by service men who are highly trained crews,pilots,and with the assistance of some of the sophisticated modern military assets provided to the armed force is the core strength that allows the Indian Air Force the capacity to provide effective support to the Indian troops in the battlefields and offer rapid response evacuation ,search and rescue operations and relief supplies to be delivered to areas it by natural disasters. Indian Air Force has been active in some of the extreme relief operation during the events of natural calamities in order to provide relief to the affected areas. From the official website you can get Indian Air Force Y Group Solved Question Paper In Hindi and English. Therefore for a individuals to be recruited as an air force service men is one of the toughest one where the candidates are required to clear through various selection process that are conducted as per the criteria that are set according to the various stages of the selection process. But prior to the selection the candidates will be required to qualify under the various eligibility and qualification requirements that are prescribed for the recruitment of each of the units of the Indian Air Force. Every year during the recruitment held by the Indian Air Force across the country over various regions where huge number of individuals with respective eligibility enroll for the recruitment, however only selected number of candidates are recruited based on the number of vacancies that are available for the various unit or the post of the Indian Air Force. The recruitment are held in terms of two categories that are X & Y Groups which are responsible for recruiting new batch of candidates under various trades of the Air Force. In this article we will focus upon the Y group recruitment regarding the solved question paper,model paper which the candidates will be able to obtain in the form of pdf files and prepare through these study materials which will help the candidates for their preparation made for the written exams held during the selection process. Further on we will provide the individuals with the necessary study materials and a brief insight regarding the written exam and the pattern along with the assistance to the individuals who desire to acquire these study materials that are available. However the candidates as mentioned above will be required to possess the required qualification and eligibility criteria as set for each of these trades or if the candidates fails to qualify under these criteria then the individual will not be allowed to proceed any further for the selection process during the recruitment. The selection process is based on various criteria and for which it is comprised of various stages of different test which the candidates must clear to ensure their selection onto the next phase as followed. The selection test consists of physical test,medical test and most importantly the written test or the common entrance exam which is the toughest of them all,although every selection test is equally important but the written exam is the exam which the candidates will find it tough to clear. The written exam will be based on the various syllabus and the topics that have been prescribed for according to the trades and these syllabus and topics will cover up the entire written exam questions that are set. The written exam will be conducted on all Indian basis which will increase the competition among the candidates,although the questions will be set based on objective type or multiple choice questions,and the individual are to complete the exam within the time that has been allotted based on the trade,their will be negative marking scheme for every incorrect answer provided by the individuals. The candidates are required to pass in each of the subjects and in aggregate too my scoring the minimum passing marks set for each section and for aggregate,failing to do so will result in disqualification of the candidates. Therefore in order to clear the written exam the individuals will require the best study materials so that they will be able to have the best and effective preparation that will be helpful and beneficial for the candidates during the written exams. Hence below we have provided the candidates with some of the study material that have been found to be effective in order to achieve better and effective preparation and these study material will be in the form of pdf files which the candidates will be able to download through the links that we have provided to assist the candidates. Indian Air Force Y Group Solved Question Paper:- Among the various study material or source of information are these solved papers which have been solved by the experts and since these set of papers are entirely based on the syllabus and the topics that are a prescribed for the written exams is on fact which makes these study materials of vital importance. The question paper of the previous year or previous written exam are solve for the candidates who are in search of dependable study materials and are strictly based upon the syllabus and topics that cover the entire written exams. Preparing from these sets of question paper will not only provide the candidates with the study materials but also will provide the candidates with the complete information regarding the exam pattern and the marks distribution which will be helpful for the candidates. Air Force Y Group Model Paper:- The model paper are the set of study materials that are prepared by various experts and cover the syllabus and the topics as per the prescribed syllabus and the topics. Altough the model paper are prepared by the unofficial experts but these will be strictly based on the syllabus and will be the exact pattern of the question patter and the exam pattern.There are various set of model paper that are available which will be able to provide the individuals with a wider range of information for the preparation of written exam. The model paper will be able to provide the individuals with the information and study material for the entire section or the subjects which the individuals will require during their preparation for written exam. Therefore the candidates will be able to extract the information for every section from a single source which will be less time consuming and will help the individuals which will boost the preparation in a effective manner. The candidates will be able to download these files through the link provided by the website. The above information which have been provided with the utmost knowledge and the study material that have been provided are extracted through various source which are dependable and some form the legit and official sources. Hope the information and material we have provided will be useful for the candidates in terms of their written exam. The candidates are advised to check the site time and again as we will update any sort of information regarding the Indian Air Force and the study material that will be acquired through various source to provide the individuals with better and proper information and study materials to help them during their preparation for their written exams. Lastly individuals with any sort of queries shall comment below regarding the information and we will get back at you asap with the best sets of information that is required by the individual such as our primary objective is to provide the necessary information and assistance to the individuals who seek information with their desire to serve the nation through the Indian Air Force. Thank You and Good Luck. Join Indian Air Force Salary Slip 2018:- Get Indian Air Force Rank Wise Salary Chart and check Officer, Pilot, Lieutenant Grade Pay/Salary Per Month. The Indian Air Force is regarded as one of the major armed force and an integral unit of the the Indian Military enforcement.General duty of the IAF OS the security of the nation and it protection through the aerial territory. Indian Air Force is served by the total of 140,139 active personnel and with an estimate of 1,729 plus aircraft which offers the IAF in the fourth position among the airforces in the world. The Establishment of the IAF has been of immense support of the Indian democracy interms of the safety of the nation through the watch over the airspace and the aerial warfare during the time of national security. IAF has been an active unit of the armed forces since its establishment which took place on the 8th day of the month of October in the year 1932. Although the IAF was known as the Royal Indian Air Force before the independence of the Indian Democracy until nation became Republic,the IAF also served as the Dominion of India before officially being known as the Indian Air Force. It is considered as one for the most respected and honorable field of service under the Indian Military with some of the distinct service that is offered by the IAF through the service men of the different units of the force. The highest rank in the IAF is the Chief of the Air Staffs(CAS) known to be the Air Chief Marshal who are honored by the four star on their shoulder,the overall responsibility of the IAF is upon the Air Chief Marshal who is the driving force of the total armed forces of the IAF. Compare With:- Indian Army Salary 2018 and Indian Navy Salary 2018. However the President of India is appointed as the Supreme Commander of the IAF and is assisted by the respective Air Chief Marshal of the IAF. The Headquarters of the IAF is basd in Delhi. The service under the IAF is one of the challenging service with the risks of the uncertainties that should be face by the service in times of emergence where the major priority is national security. Over the years the IAF has been a promising service of armed force and has produced some of the best service men in its respective filed of service with the bravery and the courage that has been exhibited by the service men of the IAF. Every year number of new cadets who apply for the recruitment for the service under the IAF,but only countable cadets who are selected through the recruitment process after clearing the test of the recruitment conducted by the IAF authorities. Want to Join Indian Army, then visit this site. IAF being of the challenging armed force which has been a rising field of service in due course of time also provide the best possible facilities for their service men in terms of allowances and also offers a good salary based on the rank or the position of the individual service man. There are many ranks under the IAF which is conferred to the cadets who are a recent or new recruit of the IAF and with the opportunity of promotion of the cadets to a higher rank after a certain period of service under the IAF. The basic salary of the service men differs from rank to rank staring from the lower ranks to the higher ranks,but even though the salary for the service men are hansom and with the bonus of special allowance to the service men and to the respective families of the service men has been allowed which provides allowance interm of the medical sector,educational sector,etc. MSP (Military Service Pay): Rs.15,500. The ranks of the flying officer is the first or the lower rank that is offered to the cadets (male/female) after the completion of their commission training under the IAF. However the cadets are eligible for the promotion which shall be offered based on the service of the cadets. The cadets must have served the IAF for atleast 2 years to be offered the promotion by the IAF. Although the grade pay is abolished for the cadets or the flying officers the special perk known as the MSP(Military Service Pay) is offered to these rank officers. The rank of the flight lieutenant is a rank higher than the flying officer which is offered to the service men who have served in the IAF for more than two years.But the promotion of a flying officer to the rank of flight lieutenant is offered to a service men based upon the service provided by the respective service man. Since the promotion of a service man of the IAF depends upon the period of service offered and the quality of service offered by the individual is the main criteria for the promotion to a higher ranks. 4).Qualification and knowledge of the service men. The rank or the position is a rank that is higher than the two previous ranks of flying officer or the flight lieutenant.However the service man can be promoted to the rank of the squadron leader after serving the IAF for a period of 5 year. The promotion is offered depending upon the quality of the service a service man has offered to the IAF. The rank of the wing commander is the higher rank than the rank of the squadron leader.A service men is promoted to the rank of the wing commander after a service period of 13 years in the IAF. The rank of the group commander is one of the higher rank among the other ranks of IAF which is offered to the service men based upon the service they offer the unit of the IAF for a longer period of time. There is no certain years of service after which the promotion is offered. The rank of the air commodore is among the highest ranks that is offered to the service men of the IAF. This ranks of the IAF is also regarded as the junior general rank which is a one star rank offered by to the service men by the IAF. The service men appointed on the rank of the group leader are promoted to the rank of air commodore under the IAF depending upon the service that is provided by the service men of the IAF. Generally the ranks of the air vice marshal is the higher rank than the rank of the air commodore which is offered to the service men serving as the air commodore under the IAF for a certain period of time. The rank of the Air Vice Marshal is honoured with tw stars and generically Air Vice Marshal maybe addressed as the "AIR MARSHAL:. Air Marshal is a rank higher than the air vice marshal which is considered to be the 2nd highest rank in the IAF that is served by the service man who have been promoted by the IAF after serving as a air vice marshal of the IAF. Since the rank of the Air Marshal is a immediate senior rank to the Air Vice Marshal the rank is offered with three stars. The ranks of the Air Marshal (approx scale) is an equivalent rank to that of the HAG SCALE where the only difference lies is the basic salary of the rank. The active rank of the IAF is known to be the Air Chief Marshal which is offered to the service men who have offered the IAF who have served with their distinct service under the service of the IAF. The Air Chief Marshal is the only rank which is honored by 5 stars on the shoulders. Mentioned above are the basic salary and the MSP (Military Service Pay) which is offered to the service men of the IAF for their distinct service for the sake of national security. 3).Educational relaxation for the childerns of the service men. 4).Special previlages to the families interm of the daily comodities. 5)Casual leave for a certain period of time. Now here we descibe all imporatant details about the Indian Air Force Salary 2018. If you have any query regarding to the Indian Air Force Rank Wise Salary Slip 2018, then you can comment here for any queries. Get all important details about the Indian Air Force from this site and visit official site for more details.